A fun way to practice your favorite musical instrument. Visual cues, playback and performance reports help young musicians train their ear to detect notes that are wrong or out of tune. 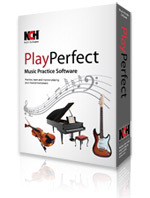 Make your musical practice sessions more effective with PlayPerfect music practicing software. PlayPerfect is a completely free music practice program and we hope you will like it so much that you will try our other software for musicians and audio software for a complete set of audio editing and creation software tools. Create sheet music from a recording with TwelveKeys Music Transcription. Create professional audio productions with MixPad Multi-track Mixer. 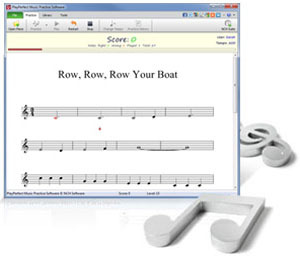 Write music scores and notation with Crescendo Music Notation Software. Always play in time by practicing with TempoPerfect Metronome Software. For more software see our Software for Musicians page.